The dangerous and unenviable task of cleaning up the Fukushima reactor has hit its latest snag: Two snake-like reconnaissance bots had to be abandoned inside the reactor—after one got stuck and another’s camera was damaged by radiation. The Fukushima cleanup relies almost entirely on robots because radiation levels inside the reactor are still too dangerous for humans. 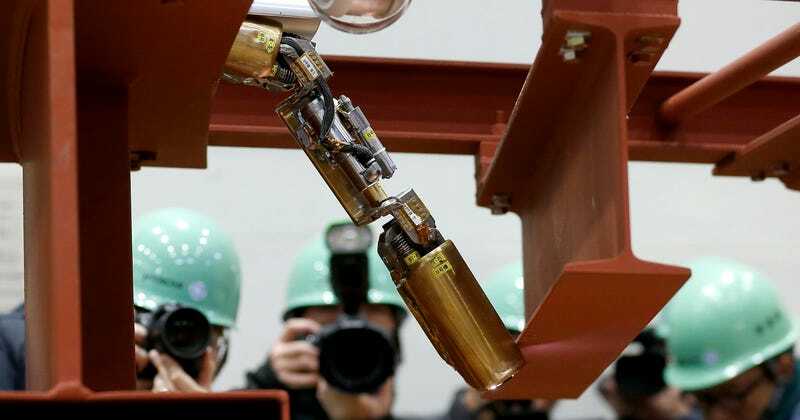 TEPCO, the company managing the efforts, has a small robot army, designed to do everything ranging from radiation measurement to decontamination with dry ice blasts. The two lost robots were both shape-changing inspection bots designed to investigate the floor of the reactor’s containment vessel. The first, sent in on April 10, got stuck after just a few hours, blocking the path of other robots. A second was dispatched from a different path a few days later, but engineers decided to abandon it when a camera used to monitor its progress malfunctioned because of radiation. The first robot did record some video and the second some radiation and temperature readings, so it wasn’t a total waste. But overall, cleanup efforts at Fukushima has been notoriously problematic. Here’s to hoping that other robots won’t meet a similarly premature end.